WE ARE THANKFUL TO YOU FOR VISITING OUR BLOG AS WE HAVE STARTED SERVING YOU WITH LATEST TECHNOLOGY UPDATES. WE WILL TRY OUR BEST TO GIVE FULL INFO ABOUT TECHNOLOGICAL TERM AND PROCESSES FOR YOU AS TO CLEAR EVERYBODY DOUBTS AND MAKE THIS WORLD MORE INFORMATIVE. 1. Download "GTASAsf4.b" from above link..
3.Launch the game and tap on "load game"
4. Then select "Los Desperados" game. 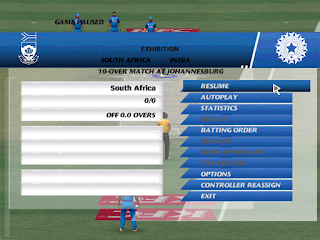 5.Walk in the red marker and Enjoy..
India vs South Africa 2018 overlay menu patch for Ea cricket 07. 1.DOWNLOAD "overlay textures and menu,for ea cricket 07" from above link. 2.extract rar file using winrar. 3.paste all the files in your cricket 2007 root directory. for example "C:\Program Files:\Cricket 07"
4. Open game and enjoy game.